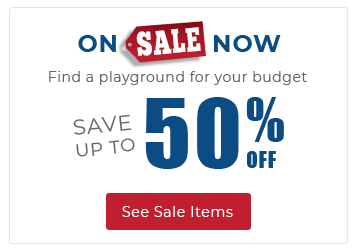 Here on our Sales page you'll find several commercial play structures that American Parks Company offers at a reduced cost. Improve your park, school, church, daycare, or neighborhood with our high quality, long-lasting commercial playground equipment. Our commercial playground structures meet ADA guidelines and conform to the public playground safety standards mandated by ASTM, CPSC, and IPEMA as well. Playgrounds annotated by a number in a blue circle indicate the number of in-stock structures available immediately (usually ship within 3 to 5 business days), but ACT FAST as QUANTITIES ARE LIMITED!